Guernsey No. : 43 and 38 (1966), 49 and 52 (1967) 51 (1968). 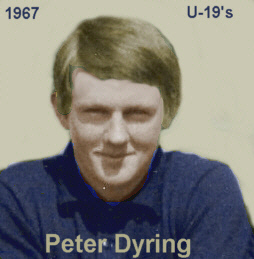 Peter L Dyring was an Under 19 player at Carlton in 1966-69, captaining the Blues in 1966-1967. He was originally from Bulleen - Templestowe Youth Club, and was recruited from Hawthorn 4ths (Under 17s) in 1966. He was listed in the Carlton Senior list from 1966 to to 1968. Overall Dyring played 54 games at both levels. Drying wore five different guernsey numbers when he represented Carlton reserves, they were No.43 (on 7/5 off 11/6) & 38 (on 20/8 off 13/9) (1966), 49 (on 22/4 off 20/5) & 52 (on 12/6) (1967) 51 (on 15/4) (1968). In 1967 he was listed on Carlton's Supplementary list at the beginning of the season and in 1969 he was listed under to be considered when available. Dyring has been a supporter of the Blueseum, providing pictures and reports of his time at Carlton. Dyring reported that given his age, the Club would arrange a taxi to collect him from school (Box Hill Technical) and take him to training. Dyring was shown around the Club Rooms by Gerald Burke (secretary at the time). After training with the team, Dyring was introduced to Ron Barassi who gave a 'very strong presentation on where Carlton Football Club was heading, and why. He determined that if we wanted to be with a successful VFL Club, then Princes Park should be our second home'! The pictures are summarised in the link below. Contributors to this page: Bombasheldon , molsey , Jarusa and pblue . Page last modified on Thursday 25 of April, 2013 12:58:52 AEST by Bombasheldon. 1985 Rd 12 - Paul Meldrum. 1993 Rd 18 - Ang Christou Rising Star winner.